I’d like to start this post by apologising for the quality of these pictures. Apart from the first one that was taken by Lee Thompson they were all taken one winter evening in deepest darkest Sheffield. I have been planning on sharing this tutorial for a long time but as I wanted pretty pictures, and life got in the way of taking said pictures, the tutorial got postponed month after month. I’ve still shared it with my students and a few of you out there who just asked so nicely. But only after making you swear not to share. A shiny pretty thing of a tutorial was imminent after all, right? Last month the enquiries for a tutorial increased, possibly thanks to the helpful handlers at QuiltCon in Nashville who happily flashed my quilt backs to passers by. With two of my quilts, Modern Times and Paper Round, both having had the faced and mitred treatment, my backsides had more exposure than ever before. I’ve not included instructions on how to make the binding but here is one by Purl Soho I’ve used a lot. I attach it the same way as a ‘normal’ binding, again Purl Soho’s tutorial on this is very helpful. I’ve adapted it with the help of Jenni Smith ‘s tricks from her brilliant #toptiptuesday so that the joints are on the bias rather than straight. I love Jenni’s genial and clever tutorials. Any hoo, I’ve promised a tutorial of my own and here it is… lets get cracking. First, decide how wide you want your facing to be. Mine is usually around an inch. Add a 1/4″ seam allowance to this and double it. So if you’re after a 1″ facing it’s: 1″ + 1/4″ x 2 = 2 1/2″. Calculate how much binding you need. 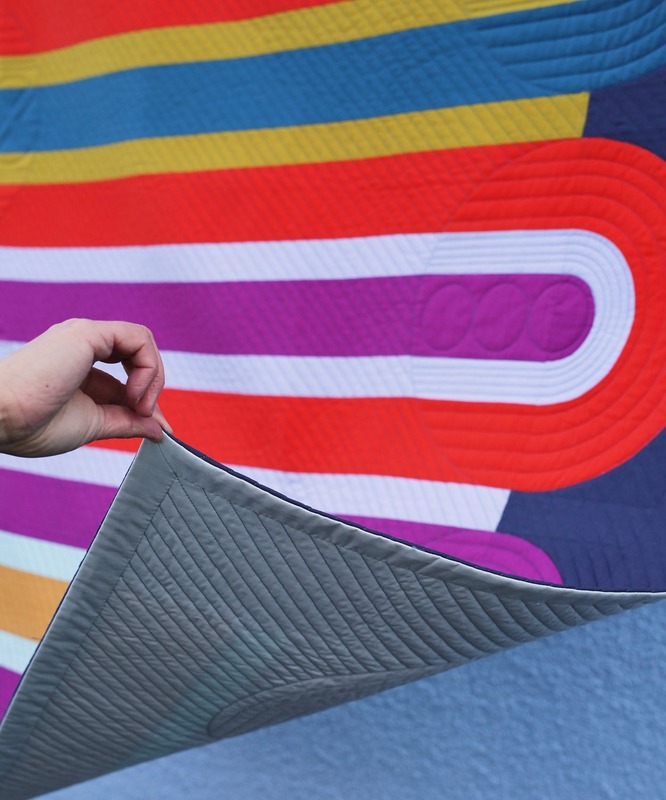 I would want the length of the strips to total the circumference of the quilt plus 12″ extra to allow for joints and corners. Next you want to match the folded edges, pin so they don’t shift and sew right on that creased line (see pictures below). That sewn line was dead straight in real life. I promise! Cut the triangle off, a 1/4″ from the sewn line, and press seams open (left pic). Change your stitch length to 0.5 and sew, on the seam that attach the binding to the quilt, starting 1/2″ from the corner. Pivot a couple of stitches before you get to the mitred seam, cut the corner with three or four tiny stitches and pivot again, finishing back on the pre-existing seam (middle pic). Cut the corner off next to, but not on, the seam (right pic). Press the binding away from the quilt top. Use a tailor’s clapper if you have one to get a really crisp edge. I’ve yet to find a lovely and smooth vintage clapper I like so I’ve been known to grab anything heavy, like a quilt book or magazine, that’s close to hand. Now turn the corner, and poke it to make it nice and sharp. I use the Clover Hera Marker Slim 4002 and it’s perfect for this job. Lastly, pin the facing, making sure it doesn’t show from the right side, and hand-sew it down using a slip-stitch. Be careful not to sew through your quilt. Finish off with a press, I use a cloth between the iron and the quilt at this point as I want a sharp edge but without the seam allowances showing through.